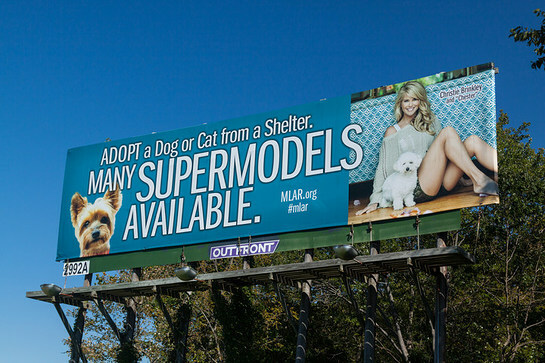 Main Line Animal Rescue’s billboards along the Pennsylvania Turnpike feature Supermodel Christie Brinkley and her rescue dog, Chester. Miss Brinkley, a staunch advocate on behalf of animals, agreed to be featured on the billboards to encourage others to adopt shelter pets. MLAR met Miss Brinkley through television personality/author Jill Rappaport and subsequently adopted Chester from the Pennsylvania based animal rescue. “One of the things that makes Christie so beautiful is her willingness to help at risk animals” said MLAR’s founder Bill Smith. MLAR is one of the largest no-kill animal shelters in the country with over 360 dogs, cats, rabbits and other animals available for adoption. MLAR receives no government funding and relies solely on private donations to support their lifesaving programs.